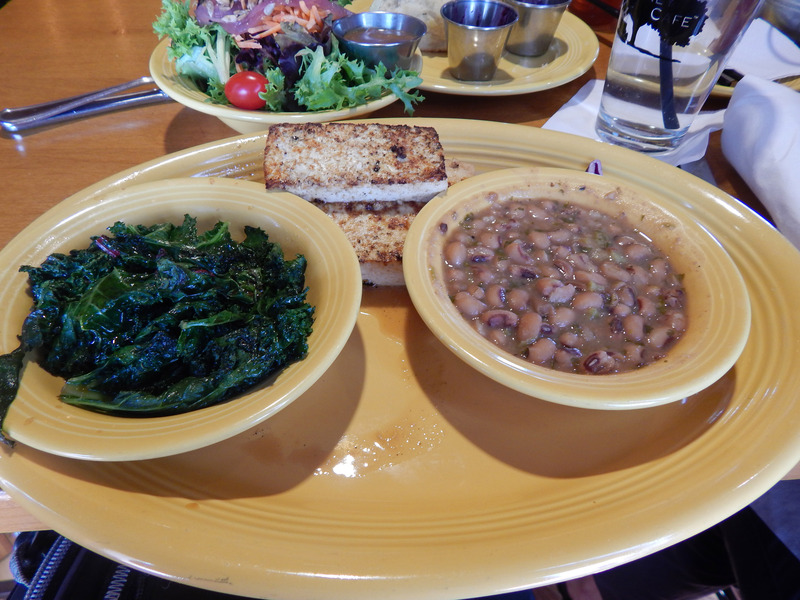 Home › American › If You’re Vegan, Don’t Eat At Tupelo, Honey! Tupelo Honey is a rock star of a restaurant, one of those that inspires a cult following. The original is located in Asheville (vegan and vegetarian capital of North Carolina) and offers “Nuveau Southern cuisine.” (Their misspelling, not mine.) Tupelo Honey has seven locations in North Carolina and Tennessee, two cookbooks, and a huge reputation for being very vegetarian and vegan-friendly. So I was excited when, for the monthly company birthday luncheon, the birthday girls chose the new Tupelo Honey restaurant that opened in Charlotte, NC in December. It’s in Southend, in the space vacated by the veg-friendly Pewter Rose. True to its reputation, Tupelo Honey is indeed very vegetarian friendly – especially for those vegetarians who really, really, reeeeeeeeally like cheese. There’s Fried Green Tomatoes served over Goat Cheese Grits. There’s Tupelo’s Encore Cheesy Grit Cakes. There’s Pimento Cheese with House Made Tortilla Chips. There’s Cheesy Onion Bisque. There’s Misse’s Asheville Veggie Melt – an open faced vegetable sandwich topped with Havarti cheese. There’s a Classic grilled cheese sandwich with cheddar. A Downtown grilled cheese sandwich with Havarti and Pimento. An Uptown grilled cheese sandwich with Havarti and cheddar. Cheesy Smashed Cauliflower. Scratch-made Mac n Cheese. A Venerated Veggie Bowl which again contains Goat Cheese Grits. Vegetarian “eggy, cheesy” Breakfast Pie. Vegans have far, far fewer choices. And, in addition to the cheese and eggs (in the fried foods), we must also watch out for honey, which is a Tupelo Honey trademark. It appears in an astonishing number of Tupelo Honey dishes – Tepulo Tofu Wings, biscuits, fruit salad, and, I suspect, salad dressings. There’s not a single vegan appetizer or soup. There’s salad, of course. (Poo!) The Tupelo House Salad ($6.45) is vegan. The Changing Leaves Spinach Salad ($8.95) and Southern Spring Salad ($8.95) could both be modified to be vegan. And for $3.75 you can add grilled tofu – a nice option. The Basil Vinaigrette, Pecan Vinaigrette, and Sesame Orange dressings are all dairy free. However, I would check to make sure the sweeter Pecan Vinaigrette and Sesame Orange dressings don’t contain honey – my server didn’t know for sure. As far as sandwiches and entrees go, Tupelo Honey does have the ubiquitous vegan black bean burger – the Grateful Dead Burger ($8.95). One might have thought a restaurant with the reputation of Tupelo Honey could have coming up with something a bit more … original than that. (It may be different in Asheville, but in Charlotte almost every “American” restaurant has a black bean burger as their token vegetarian/vegan option.) I might have ordered this anyway, except the waitress wasn’t sure if it was vegan or not. I later determined it was by Googling and finding the recipe for it in the Tupelo Honey cookbook. Which leaves vegans with the Tupelo Honey Vegetable Plate – three ($10.95) or four ($12.95) “Farm Fresh Sides.” The vegan Farm Fresh Sides are New South Sauteed Greens, Benne (sesame) Coated Asparagus, Tupelo House Salad, Marinated Grilled Tofu, and Salsa Verde Black Eyed Peas. I ordered all but the Benne Asparagus. The Salsa Verde Black Eyed Peas looked and tasted canned. From the name I was expecting something zesty, perhaps even a little heat. Yet, although I could see a tiny bit of green – the salsa verde – the beans were very, very bland. 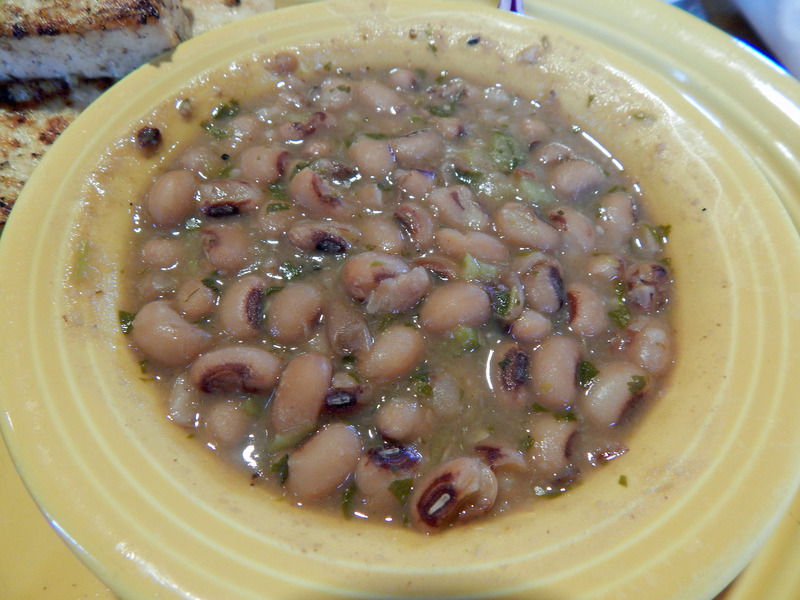 I suppose I should just be happy Tupelo Honey offered black eyed peas and not the dreaded vegan black beans. Canned black eyed peas? I suppose I should just be happy they weren’t the mandatory vegan black beans. New South Sauteed Greens – Also a disappointment. In part, this may have been because I was expecting what we in the South call “greens” – turnip greens, mustard greens, or collards. 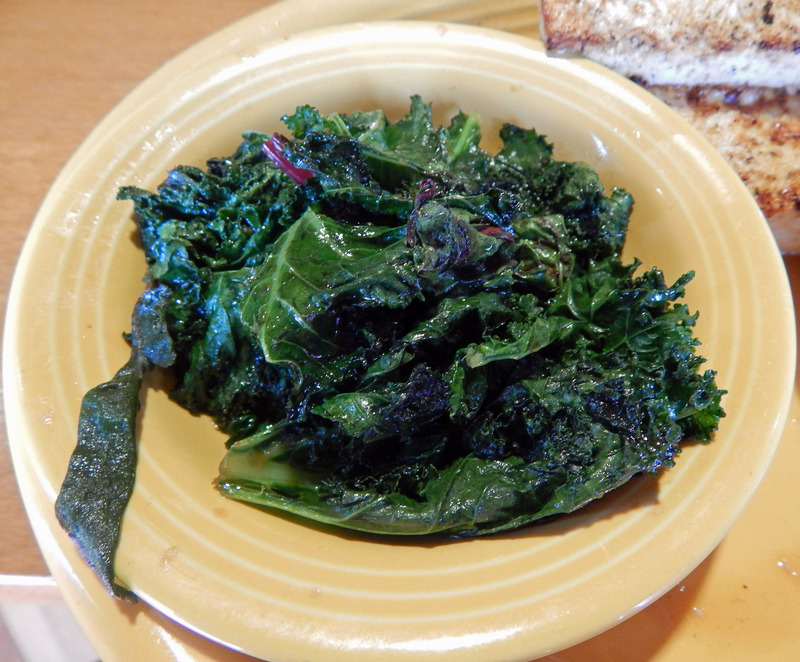 Instead, this side appeared to be under-cooked and under-massaged kale. Besides needing more cooking, the tough leaves could also have used more seasoning and maybe a splash of balsamic vinegar. Additionally, they were extremely greasy from whatever oil they were sauteed in. A few leaves of kale, sparkling with grease. 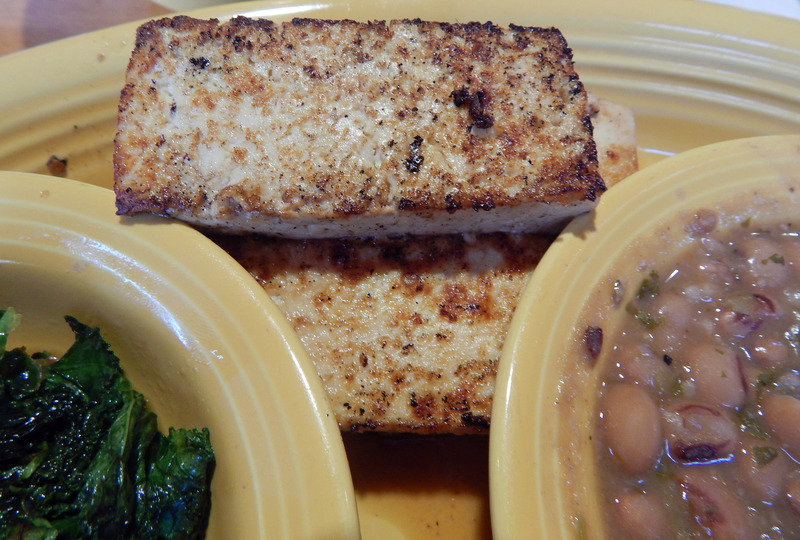 Grilled Marinated Tofu – This may have been the best of the four sides. I liked the taste of the marinade and they did a good job of grilling the tofu – a little crispy on the outside and warm and firm on the inside. Not just soft and raw. However, the tofu was definitely NOT marinated – just brushed with marinade and then grilled. Had the tofu actually been marinated, so that the inside had a little flavor, this might have been good. As it was, I wound up smearing some of my basil vinaigrette salad dressing on the tofu. 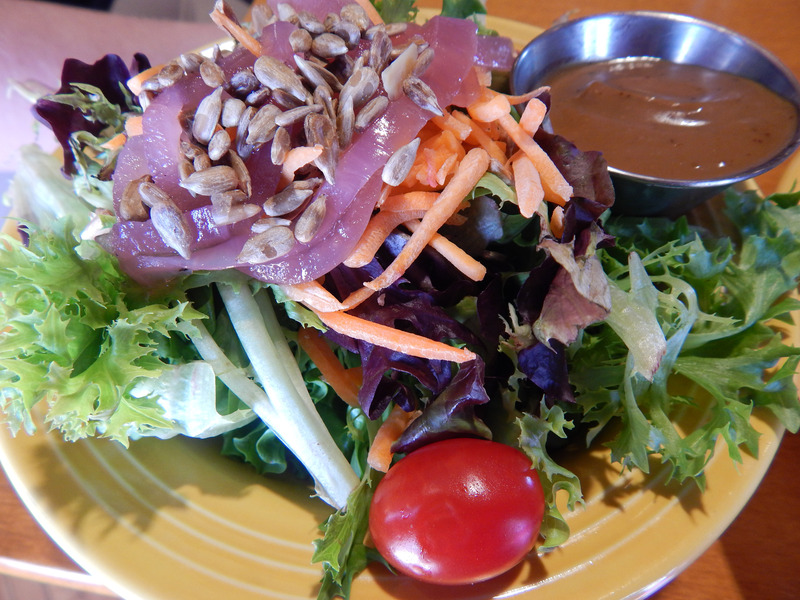 Tupelo House Salad – A salad without much substance. Two small rings of their “famous” pickled onion. (If their onions are famous, why not give me a whole slice – or a few more rings, so I can enjoy this signature item?) One lonely grape tomato. A little bit of shredded carrot, and half a teaspoon sunflower seeds. Disappointingly, the greens were not baby greens but very large leafs that had not been torn, meaning a knife had to be utilized in the eating of the salad. Awkward, especially at a table with limited elbow room. My coworkers? (All tolerant omnivores, BTW). Those who ordered chicken seemed to like their meal the best, saying the “hormone-free” chicken tasted better than conventional chicken. Some also said Tupelo Honey does an amazing breakfast, but looking at their menu, I really can’t see anything for a vegan to order. Lots of wood. Wood walls, wood tables, wood chairs, and rather slippery wood floors. It felt a bit hard-edged to me. Perhaps some curtains or cloth napkins instead of paper ones would have helped. Service? Service could use some serious improvement. I knew for at least two weeks beforehand we would be dining here. I messaged Tupelo Honey on Facebook and their web page inquiring about their vegan options. No response. Not cool. Not cool at all. It took over an hour for the waitress to bring our food. Not an hour from when we sat down, but an hour after we placed our order! The waitress was not knowledgeable about vegan items and ingredients. In some restaurants I’m willing to cut the servers some slack, but a restaurant with the veg reputation of Tupelo Honey? Servers should know what is vegan and not vegan, and what items do or do not have honey. The front desk hostesses were … new or airheads. I’ll give them the benefit of the doubt and say they were inexperienced. When our party of nine arrived, they told us they had no large tables and we would have to sit at two tables. Then one of the hostesses had an “ah-ha!” moment and realized, “We could push several tables together for you.” Duh. If you’re vegan, stay away from Tupelo, honey! How sad when a restaurant with so much potential doesn’t live up to it! I know! I was sooo excited. I still want to try the original in Asheville, though. Thank for the great write up and I will stay away. I enjoy Fern’s and Luna’s and have never ran into to these kind of problems there. Fern’s and Luna’s have 5-star service!!! And even the vegetarian food at Fern looks creative and healthy – it’s not just cheese, cheese, cheese and more cheese. Somewhat related: if you were a vegan couple considering a move to North Carolina, which area would you choose, assuming you liked to go to restaurants twice a week? Addition to my comment: if Asheville wasn’t an option, that is. Charlotte! (You knew I was going to say that, didn’t you?) Charlotte has recently boomed in terms of vegan places to eat/shop. We have Bean (vegan diner), Fern (vegetarian and vegan upscale food), Luna’s (raw vegan), Zizi’s (vegan deli takeout). All these places are doing extremely well and I wouldn’t be surprised if a few vegan restaurants opened soon. We have at least five chains where you can get vegan pizza (Brixx, Mellow Mushroom, Fuel, Pizza Fusion, and Pure Pizza). And while Charlotte used to not be very diverse, we also have some quite good Indian and Thai places, plus some Japanese and Middle Eastern. In the next month I’m hoping to compile a list of restaurants and add that page to my blog. I will warn you that if you look at our local paper you will get the impression there is nothing but BBQ and steak houses. Also, there are parts of the city where you have many vegan dining choices and parts where there are almost none. Thanks for the great reply! We practically lived at Bean when we were in Charlotte, although much of we ordered was probably fried. It was tasty–and it was wonderful to find an all-vegan restaurant. The chef talked to us and was very friendly and even made us some carrot ‘bacon’ for free. We have friends near Raleigh and like the area but worry that the dining options might be iffy. I’d like to see Charlotte again when it’s not the dead of winter because I’m hoping it would be more trees-y (living in Arizona right now and it’s kind of beige all the time). Oh, Chef Charlie’s the best! But a lot of the food is fried! You could mix it up a bit by going to Luna’s and Fern. I also forgot to tell you about Berrybrook Farm, which is a tiny health food store with a lunch counter. Takeout only, but very reasonably priced juices, smoothies, and sandwiches. Thanks for the review. The not being vegan wouldn’t bother me but I have friends that it would. However, tasteless, bland, overpriced food would. I definitely won’t be driving across town to dine there. You’re welcome. It was so disappointing! good review. I hate it when all there is to be found on a menu for vegans is salad. I make a killer salad at home myself…. when I’m at a restaurant I don’t want to order something that I could have made (and often better) at home. Bummer that it didn’t work out well for you. That sounds like a really disappointing meal! I hate going out to eat, spending money on a restaurant dinner, and then knowing I could have made something so much more delicious at home. The only redeeming trait is that they mark the vegan side dishes…unfortunately, they don’t mark their entrees (maybe since there are hardly any) and like you said, they don’t respond to inquiries! I was looking forward to this seemingly veg-friendly Asheville eatery, only to be totally disappointed. Thanks for your feedback, Queen City Vegan! I’m sorry (but not surprised) that you had a disappointing experience, too. What did you end up ordering? Also shows there is still a great leap between vegetarian and vegan. There really is. Most of the restaurants in Charlotte have vegetarian options – often multiple vegetarian options! But they still have nothing but salad for vegans to eat! Sorry to get back to you on this so late. I was aware Tupelo changed their menu and both Queen City Vegan and I had tried to contact management (both local and Corporate) to determine what, if any, items on their new menu were suitable for vegans to eat – and we never got a response. I’m sure the waiter told you what he had been told, but I don’t think the change was to appeal to more Charlotteans as it seems to be a company-wide decision across the various states they are located in. And how silly is it to think Charlotteans would not eat Tofu with their neighbor Luna’s Living Kitchen doing a booming business? … Thanks for the update. You are right, no reason to go back. Please feel free to pass along any other news you hear about local restaurants.